The Delta Bell release their debut album ‘Bow Out Of The Fading Light’ this week on local label At The Helm. 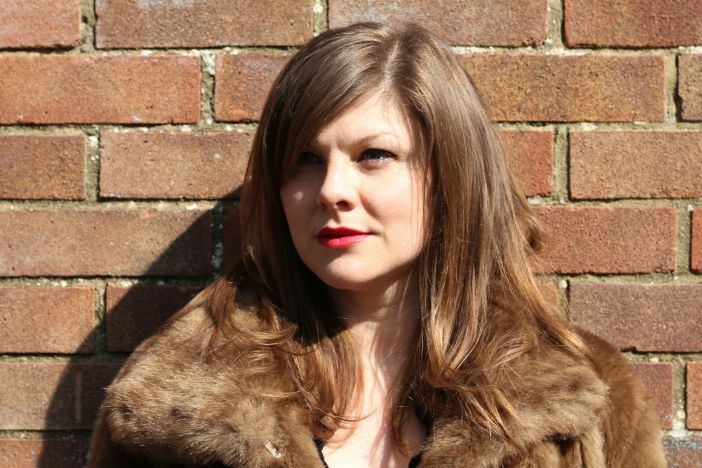 The album is a rich concoction of country-tinged Americana from Kate Gerrard, originally of Norwich but now of Brighton. Kate can be found playing as the Delta Bell, sometimes solo or as a trio but usually in a full five-piece line-up featuring Kate (guitar and vocals) along with Andrew Blake (pedal steel/guitars), Beth Chesser on backing vocals, Jules on bass and Bob on drums. The album is full of classic songs which will be as popular with traditional fans of country music as they will be amongst fans of folk and Americana here. There’s a warmth, drawing on classic sixties-style songwriting, earthy top quality musicianship and of course Kate’s Norwich-via-Nashville velvety girl-next-door vocals which help the album stand-out. Opening track is the lovely gospel-tinged number ‘Carry Us Home’, and there’s a strong gospel feel that comes through in a number of the tracks. The single ‘Wasted’ was released last year on 7 inch vinyl to some excellent reviews, with its deceptive clip-clop cowboy rhythm masking a bitter lament of lost love in which Kate asks her ex “to just take the car, …and get on that motorway and go straight to hell”. There’s the doo-wop girl-group sounding ‘Forever Yours’ and the beautiful spiritual ‘Lay Him Down’, with its subtle piano and excellent vocal harmonising from Beth and Kate. A particular favourite is the love song ‘Strings’ which also features on the excellent Hidden Trail Records compilation ‘Hidden Brighton 2‘ (with sales going to support a local youth charity), and is featured below. As Kathryn Tickell of Amazing Radio puts it, “If gospel music had been invented in England and was traditionally sung around a campfire on a lazy summer evening, then I imagine it might have sounded a bit like this”. True enough. An excellent album from a Brighton band to watch. ‘Bow out of the Fading Light’ is available from Friday 31st July online and from all good record shops. The Delta Bell’s album will also be available at their launch show on Thursday 20th August at the Verdict jazz club, Brighton.